My sister has a nice streak in her. She lets it out every once in awhile… ;). One instance of her niceness is that she let me live rent-free from February through July this year when I first had an unpaid internship, and then I was unemployed after graduation. See what I mean? Nice streak. Well, I had said I would eventually buy her something once I was employed to thank her for those months of “free” living (although I did buy mostly all of the groceries to still help out). I decided a blender was something nice to buy and definitely not something she would treat herself to (see, she’s a money hoarder). Well, a marvelous Kohl’s 30% off coupon came to my mom so I thought this was a great opportunity to buy a blender – so I purchased a Ninja, thinking it would be somewhat comparable to a Vitamix. 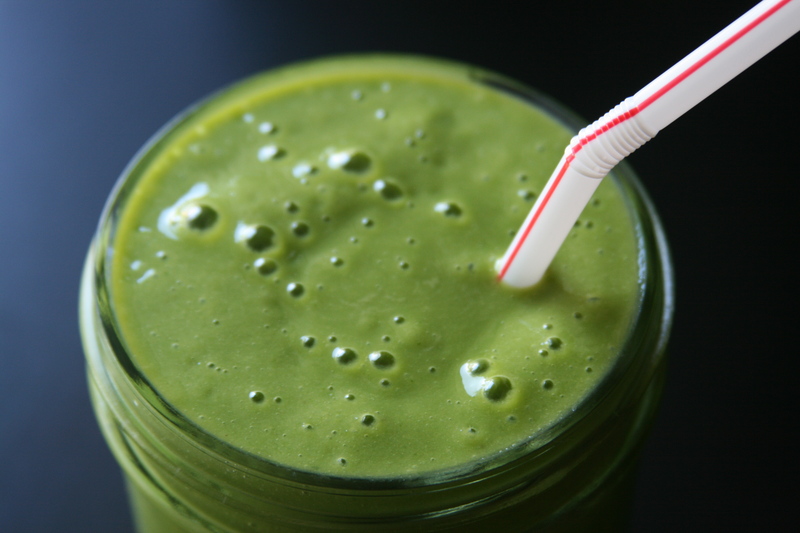 I was definitely dreaming of nice and smooth green smoothies! Unfortunately, the ninja did not live up to its name at all… I like ninjas and this thing could not do any superhuman ninja moves. There were two too many stringy smoothies coming out of the kitchen… Even the Magic Bullet beat it times 100. Sadly, my hopes for a new blender went away with the Ninja as I did not have a ton of money still to make a bigger purchase like that. Well, the morning Kinley and I went to the State Fair, she could not get the Vitamix out of her head! She said she almost bought one right then and there but held off (money hoarder getting not so hoardy). And then we get to the fair… and this happens. Yup. Exactly. Who knew there were Vitamix stands at the Wisconsin State Fair?! And TWO of them! Although we did not make it past the first one… Kinley buckled. She bought the Vitamix. She even got an extra year added to the warranty (a total of EIGHT years) and a free dry mixer thing too (to make your own flours – a $150 value). She then proceeded to walk through the fair toting this around, and I kept saying Green Spinach Smoothie so people would give me weird looks. I love it when I make people think I’m more of a freak than I actually am in real life, although I do love green smoothies. And they should too! So I basically got out of buying a blender at all. I think I’ll just not say anything and hope she forgets I offered to buy her something… Aw man, she probably just read this in her Google Reader…. But anyways, is the Vitamix everything I dreamed it to be? 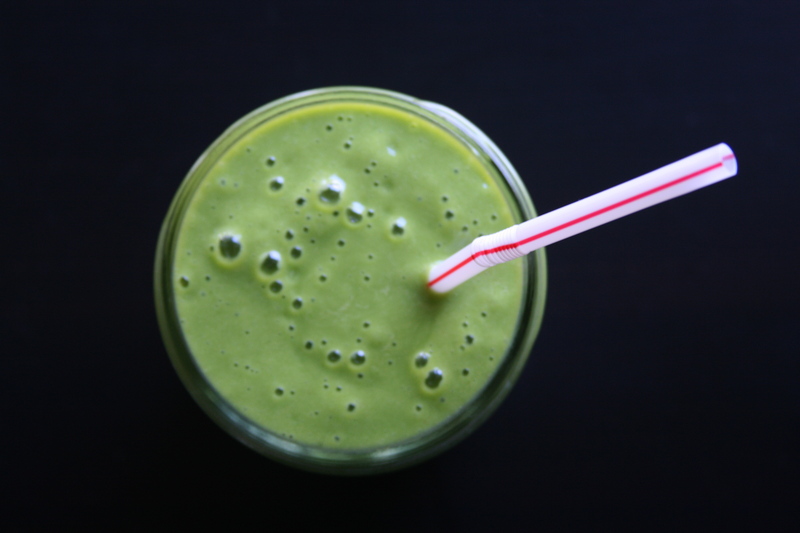 Well, just look at the green smoothie and you tell me. 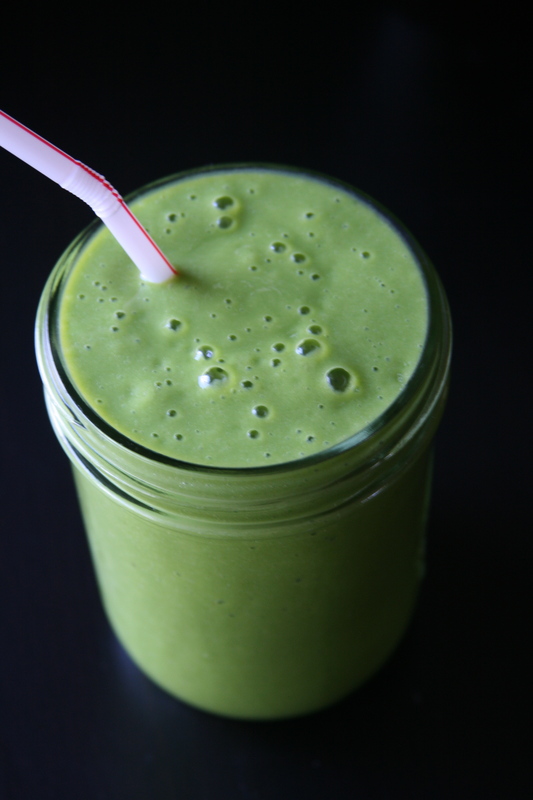 Spinach, almond milk, banana, frozen mango + pineapple. Beats the looks of my previous creation by about a million. More smoothies recipes coming soon! I like simple things. I especially like simple things that are really, really good. You know what else I like? Creating a whole meal out of things you (could) have on hand any day. I also like gardens. Surprisingly, our garden had not given up just yet. A few things have had to be “removed” due to their size and productivity level. The heirloom tomato plant looks pathetic… and yet we’re still getting tomatoes. Lots and lots of heirloom tomatoes that have been made into delicious pasta sauce, put into weekly salads, and made into delicious and fresh salsa. Actually that last one is a lie… or it actually hasn’t happened yet (but it will). The tomatoes I used in this particular dish came from a co-workers garden as did the peppers. So absolutely incredibly fresh and delicious it had to be made into a meal. So here, for your Meatless Monday, you get two recipes. Salsa + a base. Cut up tomatoes and jalapeno peppers and toss in a bowl with salt. I cut off the tips of the jalapenos and took out the seeds and the salsa ended up bring pretty mild, but delicious. I also do not have measurements because I used what was left! 1. Preheat the oven to 400′. 2. 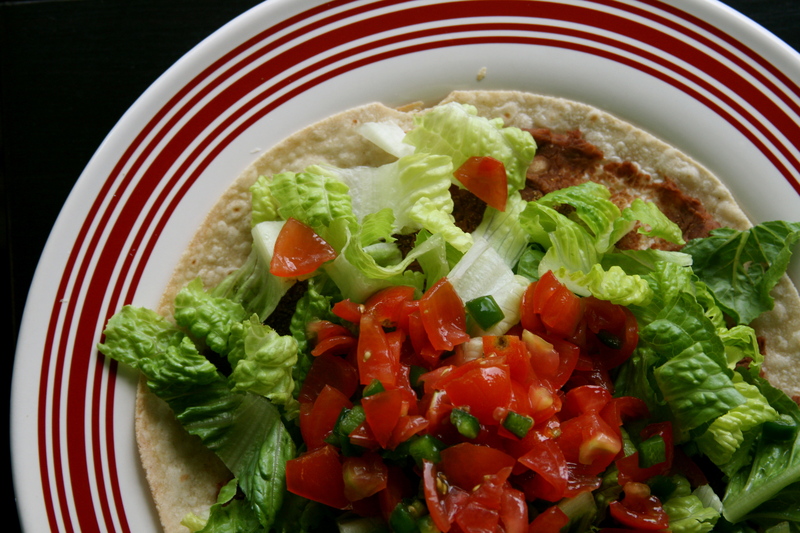 Put a tortilla on a baking sheet and pile on the beans and cumin. You could also have some cheese if you’d like. 3. Bake for 10ish minutes until the tortilla is crispy and the beans are hot. 4. Top with whatever toppings you’d like! I was pretty simple because we didn’t have a whole lot to put on top, but it was sooo good. 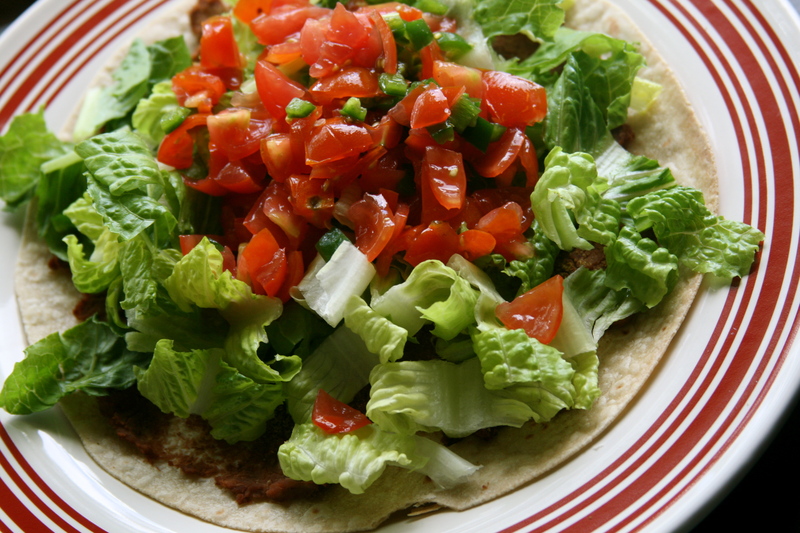 We’ve always had these as tacos where the tortilla was a shell, but it always ended up breaking apart. This way there was no breakage until I purposefully dug into eat ;). Yay for one of the toughest days of the week being over! Only 4 more days til the weekend :). I have a major sweet tooth. But I’m sure if you’ve read this blog before you’re aware of that fact ;). But the strange thing is that when I switched to eating unprocessed foods, my tolerance for sweet things went waaay down. I used to almost always choose milk chocolate over dark in a Russell Stover box – obviously I needed the higher sugar content. 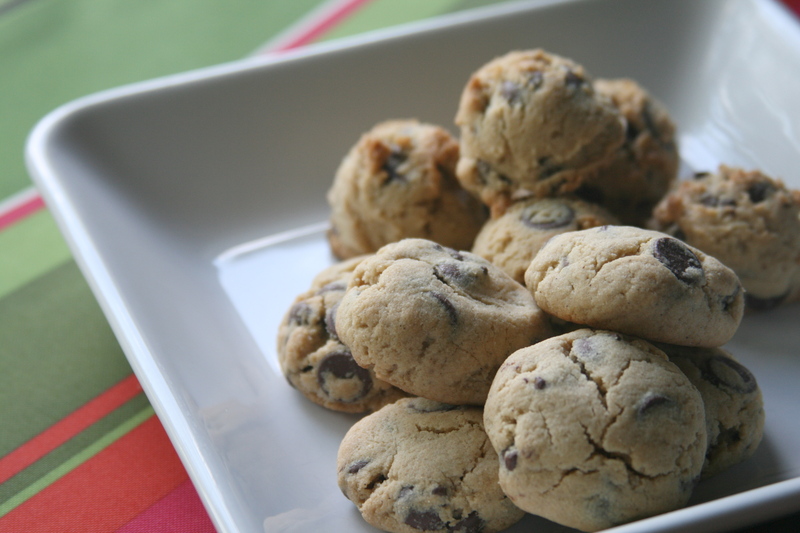 I have even on more than one occasion (I refuse to count), made this Martha Steward Chocolate Chip Cookie recipe using two – yes, two cups of sugar. And then proceed to eat the whole batch (well, not by myself obviously) over the course of a weekend. Now, I am more likely to eat dark chocolate than even semi-sweet, and never milk chocolate. Sugar in baked goods has gone down (or become non-existant) in all of my recipes. Oh, and my love for coconut has increased significantly. I used to think unsweetened coconut was, well, unsweet. Now? Oh my, it’s absolutely delectable. Coconut flakes are pop in your mouth good and coconut butter tastes like frosting. Last night, Kinley and I purchased Coconut Flour for the first time. Now combining all of my previous ramblings into one recipe? Don’t mind if I do. 1. In a small bowl, mix together the sorghum flour, coconut flour and baking soda. 2. In a large bowl, combine room-temperature earth balance and sugar with a handmixer until fluffy and smooth. 3. Mix in the egg and vanilla until combined. 4. Add the flour mixture and mix. One of the best things about gluten free flours is that there is no chance of you over-mixing! 5. 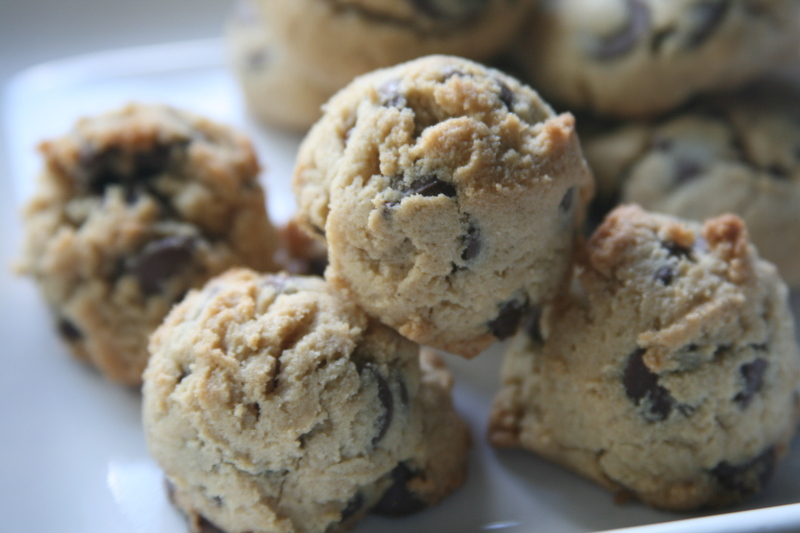 Time for the chocolate chips – so, so good. Put them in and mix. 6. Scoop and roll (these won’t change much during cooking so what you put in will look pretty much like what comes out) and place these on a baking sheet and put in a 375′ oven for 8-10 minutes. These cookies are a nice change from the Oatmeal Chocolate Chip Cookies I have baked recently since they used oat flour as the base (as did the Wheat Free Chocolate Chip Cookies). I do kind of love how the non-rolled ones look like coconut macaroons. I have big ideas for the not-so pretty and semi-crumbly ones but I’ve got to talk the sister into going along with it ;).